Ah, the holidays. What a wonderful time of year! It starts with Thanksgiving and heads right on through New Years, and nearly every major religion has something to celebrate during this time. But it’s also one of the most common times of year that people need to see a chiropractor. That might sound strange, but it’s true. There are many activities during these winter months that cause people to seek out a chiropractor, and many of these activities don’t show up the rest of the year. Let’s take a look at some of the occurrences specific to the holiday season that cause people to come into our chiropractic offices in Lexington or Columbia. People shop all year long, but not like they do during the winter holidays! But during Christmas, too many people try to carry everything they can. This might mean a bunch of bulky sweaters, a crock pot for the daughter who just went off to college, a few boxes of chocolates, and half a dozen other things. Even if they choose a cart while in the store, they’ll often try to carry everything out in a bunch of bags, which can cause the back to strain to one side. Now let’s think about the mall. While the traditional American mall is on a decline as a whole, we bet you’ll visit at least one this holiday season. What do people do when they’re in the mall? The ones who think ahead park near the store where they’ll purchase the most presents so that they can head out to the car and drop stuff off. But the average person will buy something and then lug it around to a dozen more stores before the day is done. Any uneven carrying will often cause pain in the muscles of the back and maybe even legs. Black Friday is one of the busiest shopping days of the year, and often one of the most hectic. Unfortunately, people often try to do stuff on Black Friday that can cause the need for chiropractic care of massage therapy. They might stand in line for hours before the doors open, and standing without much movement can cause a great deal of back pain even in those who aren’t usually susceptible. Then there’s the crazy lifting of the bigger items. Some will try to get the 75-inch TV out to the car by themselves, and while TVs of today are certainly lighter than when they had lead tubes in them, they’re definitely not light. What can you do? Take a friend along to help you carry anything that you might think could cause you to seek out a chiropractic clinic later that day. Black Friday and other shopping opportunities aren’t the only times that people are on their feet for lengths of time. The holidays also bring with them extended cooking sessions, where the cooks of the family are often on their feet for hours at a time. Holiday parties and choral performances can also make people stand for much longer periods than they’re normally used to. If you’re one who puts up a tree, there are a couple of things to watch out for. You see, the thing about Christmas trees is that they’re not so much heavy as they are awkward. In fact, they can be awkward in more ways that one. If you’re getting a real tree, cutting it down makes many people contort their bodies into all sorts of uncommon positions in order to get the saw into the right place. Then they use only one hand to drag the tree back to the car; this puts a great deal of strain on just one side of the body. Then they wrestle with it to get it on top of the car or into the back of the truck, which often causes a fair amount of straining as well. After all, to move a tree you often have to grab it by the trunk, and that means the weight is very far away from the body and putting extra strain on the back. Even artificial trees can give people a great deal of trouble and send them to a chiropractor. Artificial trees can actually be heavier than real trees, and people often have to bring it up from the basement or take it down from garage shelving in order to get it into the living room. Artificial trees also cause you to reach into the center column in order to assemble it, and supporting such a heavy weight so far in front of the body can cause strain to muscles. When most people think about actions that can hurt them and cause the need for massage therapy, sometimes it’s what they’re not doing that can be painful. And because the holidays are the times when people tend to take the longest trips in planes and cars, people often sit for unhealthy lengths. Not only is it bad for your circulatory system, but sitting down for too long can cause a great deal of aches and pains. Once you’ve flown or driven a great distance in order to get to a relative’s house or a hotel, you’re no longer sleeping on your own comfy bed. Often, you have no idea what kind of sleeping accommodations you might find once you get there. Maybe it will be a nice bed, or maybe it’s a pull-out couch with an old mattress. You’ve heard the mattress commercials advising you to sleep on a good mattress because “we spend a third of our life sleeping.” And it’s absolutely true, you should sleep on a comfortable mattress in order to feel better in the morning. But when you’re away from home, you might just feel some aches and pains in the morning that you could require massage therapy. South Carolina is far from the snowiest state, but that doesn’t mean that there aren’t places to ski during certain times of the year. While any sport can lay you flat on your back, skiing twists the body into positions that most people haven’t gotten into during the previous 10 months. Be sure to stretch in the weeks before a ski trip. Again, we don’t get much snow here in our state. But the fact is, it doesn’t take much snow in order to create a slip hazard. People are more likely to slip during winter than at any other part of year, which could bring them into our chiropractic clinic seeking help. 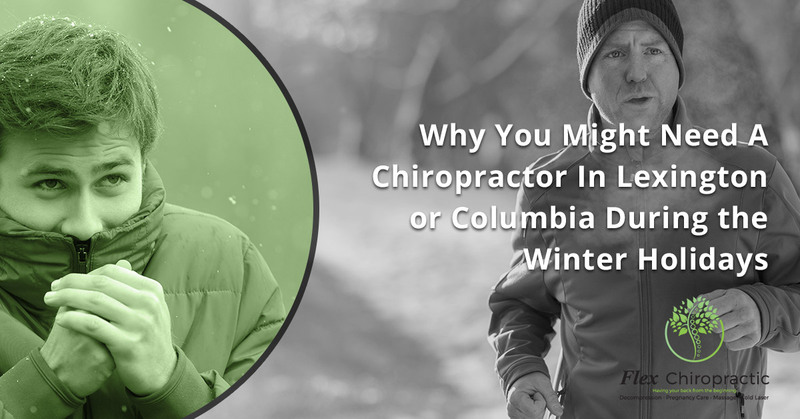 No matter how the winter months treat you, there’s a very good chance that a chiropractic appointment with our Lexington or Columbia doctors will help. Start the process right here, and have a great holiday season!